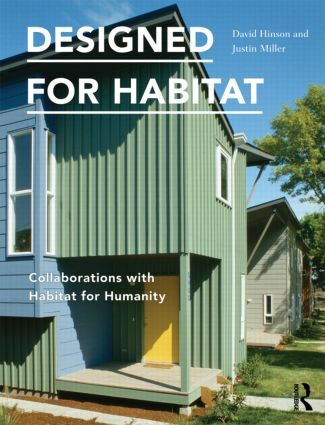 If you're looking for ways to give back to your community, then this book, the first to profile thirteen projects designed and built by architects and Habitat for Humanity, will help. Detailed plans, sections, and photographs show you how these projects came about, the strategies used by each team to approach the design and construction process, and the obstacles they overcame to realize a successful outcome. The lessons and insights, presented here will aid you, whether you're an architect, architecture student, Habitat affiliate leader, or an affordable housing advocate. Located all across the United States, these projects represent the full spectrum of Habitat for Humanity affiliates, from large urban affiliates to small rural programs. These cases illustrate a broad range of innovative approaches to energy performance, alternative construction strategies, and responses to site context. And each house demonstrates that design quality need not fall victim to the rigorous imperatives of cost, delivery, and financing.